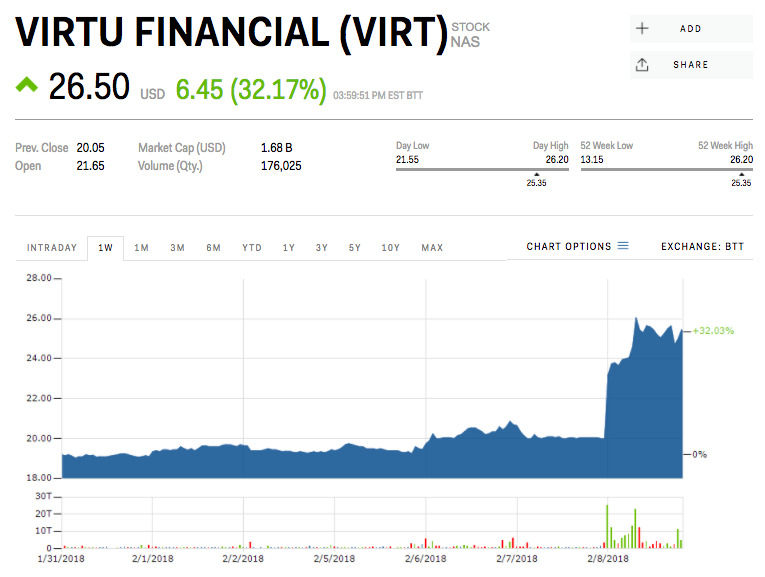 Virtu Financial, a Wall Street trading giant, beat Wall Street’s expectations on Thursday when it announced its earnings for the fourth quarter. The firm reported earnings per share of $US0.28 a share, $US0.16 higher than the consensus of $US0.12. Virtu also threw Wall Street a curve ball, announcing a $US50 million share buyback by 2019. The stock popped at the open and continued to climb higher throughout the trading day. Things are looking up for high-speed trading Virtu Financial. The trading firm saw its stock soar on Thursday after it reported earning that came in above Wall Street’s expectations. Virtu ended Thursday trade up 30.67% at $US26.20 a share. At $US0.28 a share, the company’s reported earnings for the fourth quarter of 2017 were more than double the consensus estimate on the Street. Virtu also threw Wall Street a curve ball, announcing that it would buyback $US50 million worth of stock before 2019. Markets have seen a return of volatility after more than a year in the doldrums. The Cboe Volatility Index (VIX) climbed over 50 for the first time since August 2015 on Monday and is still standing strong at 31 points, at last check. The Dow Jones’ rout, which picked up speed on Monday when the Dow Jones plunged more than 1,100 points, turned into a full-blown correction on Thursday. These market conditions are a blessing for firms like Virtu. And that’s been reflected in its stock price, which is up more than 38% since the beginning of the week. As liquidity providers, HFTs are scanning the markets for opportunities in which buyers and sellers aren’t matched up. But when volatility is too low, like it was for much of 2017 and early 2018, those opportunities are hard to come by because there are fewer price swings.